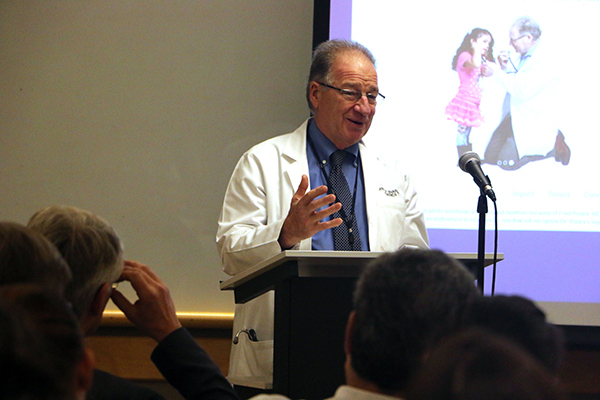 UW Medicine has created the Frederick P. Rivara Harborview Injury Prevention & Research Center Endowment to honor and continue the work of a caring pediatrician, visionary researcher, and dedicated educator. The endowment was publicly announced at an event honoring Rivara’s work on Jan. 22, attended by many current and former colleagues and trainees. For many, Rivara’s unwavering passion and dedication to healing children and families has left a significant impression. In both prepared remarks and conversation, many reflected on the impact Rivara has had in Seattle, the Pacific Northwest, and across the country as a pediatrician, researcher, teacher, mentor and advocate, including HIPRC Director Monica Vavilala, M.D., surgeon-in-chief of Harborview Medical Center Ronald V. Maier, M.D., F.A.C.S., and HMC Medical Director J. Richard Goss, MD, MPH, FACP. Rivara attributed the many successes of his long career to the joint work of colleagues at Harborview Medical Center, UW Medicine and beyond. “The achievements that I’ve had have represented this incredible collaboration across departments, across schools, across organizations, and across the country,” he said. 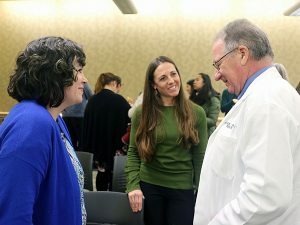 From left, HIPRC core member Megan Moore, Ph.D., MSW, and former HIPRC postdoctoral fellow and current Washington State University College of Nursing assistant professor Janessa Graves, Ph.D., MPH, congratulate core member Fred Rivara, M.D., MPH, at the endowment announcement on Jan. 22. Rivara co-founded HIPRC in 1985, and since then both he and the center have been prominent voices in injury prevention across the country and around the world. From HIPRC’s beginning, Rivara made education and training one of the cornerstones of the center’s mission. As its director for 13 years and now as head of its Pediatric Injury Research Training Program, Rivara continues to champion HIPRC. Over its 33-year history, the center has supported a diverse and talented cohort of more than 130 injury research scientists and clinicians from multiple disciplines at all stages of their careers. Support trainee attendance at national networking conferences. Rivara has made a life-long commitment to a safer and healthier world, and we hope you will join us in continuing that work. To support the fund, visit the UW Medicine endowment website. 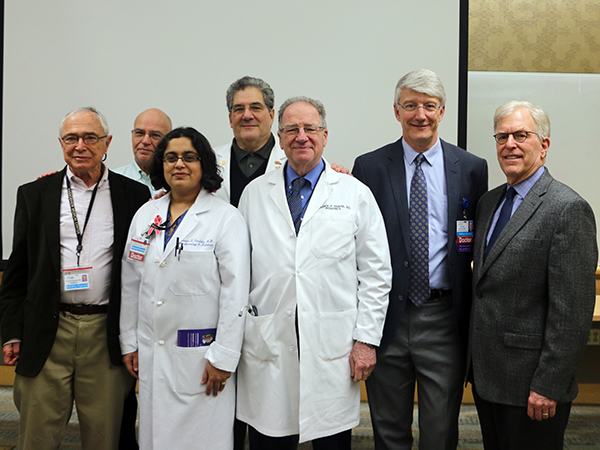 From left, HIPRC co-founder and Professor Emeritus Abraham Bergman, Professor Emeritus James LoGerfo Sr., HIPRC Director Monica Vavilala, M.D., Professor Emeritus Kenneth Jaffe, M.D., HIPRC co-founder and core member Fred Rivara, M.D., MPH, Harborview Medical Center Medical Director J. Richard Goss, M.D., MPH, and Professor and Chair Emeritus of the Department of Pediatrics F. Bruder Stapleton, M.D.